Due to overcrowded shelters, it is not possible for shelter workers to keep up with details of all animals in its care. Please do not rely on verbal descriptions of pets to determine whether your lost loved one is in the shelter or animal control facility. One person may describe a dog as a lab mix. Another might refer to the same dog as a pitbull. 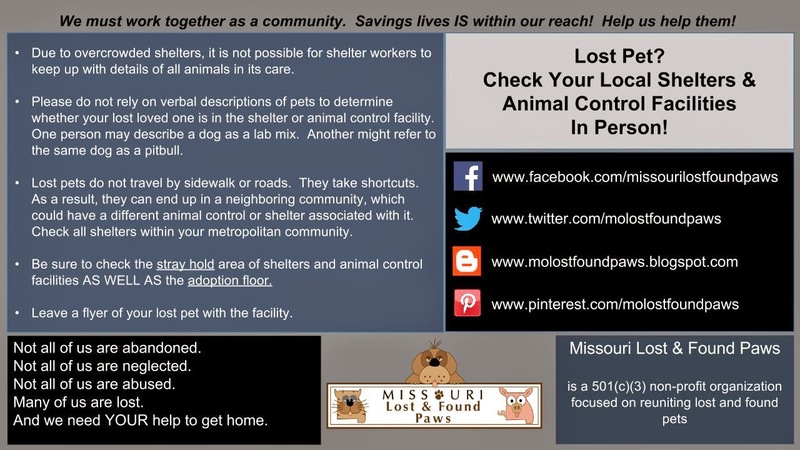 Lost pets do not travel by sidewalk or roads. They take shortcuts. As a result, they can end up in a neighboring community, which could have a different animal control or shelter associated with it. Check all shelters within your metropolitan community. Be sure to check the stray hold area of shelters and animal control facilities AS WELL AS the adoption floor.